The Academy of Our Lady of Peace Foundation is a charitable, non-profit organization which raises and disburses funds for the benefit of The Academy, its families and students. The objective of The Foundation is to make available and to enhance the Catholic education children receive at The Academy. The Foundation provides annual scholarships to families and students based on financial need. The Foundation also recognizes selected students based on merit for tuition credit, and it supports The Academy by contributing toward special projects and programs. On an annual basis, The Foundation assists approximately ten percent of Academy students, primarily with funds raised through its Annual Appeal. All donations to the Foundation are tax deductible, as The Foundation is a 501(c)3 organization. You may also contribute through Amazon Smile by selecting “Academy of Our Lady of Peace Foundation, Location: New Providence, NJ”. 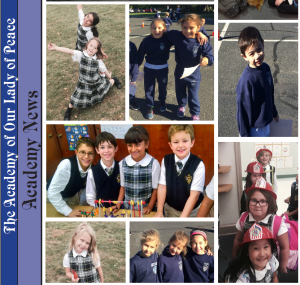 The past year has been a memorable one for The Academy of Our Lady of Peace. In September 2017, The Academy was awarded Blue Ribbon School status by the U.S. Department of Education for academic excellence. This prestigious award is given to a select number of private and public schools that represent exemplary teaching and learning. The Academy is celebrating its 65th anniversary, and it is doing better than ever. Through your generosity, The Academy of Our Lady of Peace Foundation has raised funds approaching one-quarter of a million dollars during the last nine years. Your donations directly enable families in financial need and those suffering economic hardship to provide their children with an excellent Catholic education. Your donations also make it possible for The Foundation to reward selected students for excellence, celebrating their accomplishments while motivating all to strive for their best. Our goal is to make available and to enhance the Blue Ribbon Catholic education children receive at The Academy. We enlist your financial support again this year! All Foundation proceeds are used for the benefit of The Academy’s students. The Foundation operates with minimal administrative expenses, directing your donations to worthy children and families. Please make your gifts payable to “The AOLP Foundation”. Donations are tax-deductible, as The Foundation is a 501(c)(3) non-profit organization. Remember, always start at smile.amazon.com, search for Academy of Our Lady of Peace, and Amazon will donate 0.5% of the price of your eligible AmazonSmile purchases to the Foundation. Please check out all the good things happening at The Academy. We specifically ask graduates to consider dedicating your time, talent and treasure toward the support of The Academy. Working together, we can ensure that this great gift of Catholic education within our community will be available for future generations. The Academy’s students, parents and staff are grateful for your generosity – thank you. May God bless you! Click here to read the Academy Newsletter from our Foundation!